UN Syria envoy Lakhdar Brahimi met with the Russians last week and threatened to resign if they did not get the Syrian regime to seriously negotiate. Russian diplomats in the meeting said they would like to have another round of Syria peace talks in Geneva, a western official told Al-Monitor Wednesday. Brahimi responded, what’s the point, if the Syrian regime delegation is only going to insult the opposition delegation, as it did at the last two rounds of talks, the western official, speaking not for attribution, said. The Russians said they did not have as much influence over the Syrian regime as some observers think, and Brahimi said that he thought they did have some, and that they should use it, the official described. “I would not hold my breath for Geneva,” the western official said, referring to another round of Syria peace talks anytime soon. The deadlocked Syria diplomatic process comes amid a deepening rift between its chief cosponsors, the US and Russia, over Russia’s de facto occupation of Ukraine’s Crimea region. Kerry also met with Russian Foreign Minister Sergei Lavrov in Paris Wednesday to discuss the crisis in Ukraine, and they were due to meet again in Rome on Thursday. “We agreed to continue intense discussions in the coming days with Russia, with the Ukrainians, in order to see how we can help normalize the situation, stabilize it, and overcome the crisis,” Kerry told reporters after his day of meetings in Paris. If Brahimi quits as the UN/Arab League special envoy, a possible candidate to succeed him is former Kuwaiti foreign minister Shaikh Mohammad Al Sabah, Gulf News reported Wednesday. 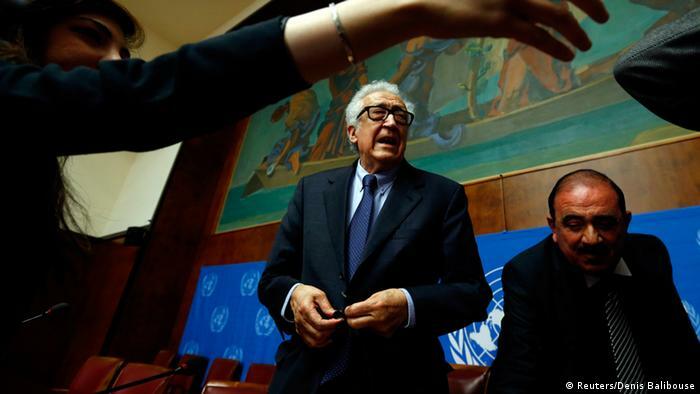 Brahimi is already the second joint UN/Arab League special Syria envoy to consider resigning. His predecessor Kofi Annan, the former UN Secretary General, quit in frustration in the summer of 2012, shortly after the first round of Geneva talks was held. Separately, the United States informed Syria’s mission to the United Nations last month that Syrian diplomats posted there will be confined to within 25 miles of New York, the State Department said Wednesday. A U.S. official said the decision to restrict Syrian diplomats’ movement to the New York area had been in the works for several months, and was not related to the breakdown in talks in recent weeks. Meantime, Brahimi’s deputy in Damascus, Mokhtar Lamani, resigned on Monday, Al-Arabiya reported. US Syria envoy Robert Ford also retired last week after serving thirty years as a US diplomat, the State Department announced last Friday (February 28). Daniel Rubenstein, the former Deputy Chief of Mission in Jordan and US Consul General in Jerusalem will be tapped to succeed him as the US envoy to the Syrian opposition, Al-Monitor previously reported. Geneva, Switzerland__ The United Nations’ Syria envoy announced that Syria’s two bitterly divided parties have agreed to sit down together in the same room Saturday for the first time, after refusing to do so today, and that he was cautiously encouraged by the discussions he had with the two sides separately over the past two days. “Tomorrow, [the two sides] have agreed to meet in the same room,” Lakhdar Brahimi, the Algerian diplomat who serves as the joint UN/Arab League envoy for Syria, told journalists at a press conference at the Palais des Nations Friday. Brahimi said both the Syrian government and opposition delegations had agreed to endorse an effort to seek a UN Security Council resolution, that would call for the international community to support the implementation of the Geneva 1 communique. The consenses document, reached at a July 2012 meeting of world powers, called for the formation of a transitional governing body to be formed, by mutual consent between the Syrian parties, and which would have full executive authority. Brahimi downplayed, however, the daunting task of clarifying ‘ambiguities’, as he put it, in the parties’ differing interpretations of provisions of the Geneva 1 document. But he made no pretense of what a long, tough road it will be to try to bring the parties to a political resolution of the conflict that has killed over 100,000 people. He said the negotiators will discuss humanitarian issues such as localized ceasefires and detainee releases, but in parallel, not in place of, the thornier issue of a political transition and formation of a transition governing body, Brahimi stressed. Western diplomats later said the two sides are expected to discuss as early as Saturday a possible agreement that would allow for rapid humanitarian access to the besieged Syrian city of Homs. “We are going for a quick win, ” one western diplomat, speaking not for attribution Friday, said. Talk about a transitional body could be on the agenda in as soon as two days time. Brahimi is mindful that he had to move on the transition, a diplomat said. Brahimi, speaking to journalists Friday, said he envisioned that the parties might continue talking here in Geneva through the end of next week, before returning to the region for consultations, and hopefully later resuming negotiations in the weeks ahead. Geneva, Switzerland __ UN-mediated Syrian peace talks got underway here Friday, and are currently expected to continue into the weekend, western diplomats said. UN/Arab League Syria envoy Lakhdar Brahimi met separately with the two Syrian regime and opposition delegations on Friday. A meeting with both sdes and Brahimi in the same room, originally expected by some to take place Friday, may now occur on Saturday, the westerm diplomats said. This will be a “step by step” process, another western diplomat said late Thursday. “The aim” on the delicate first day of talks “is to avoid walking outs ” by either side. In one seemingly positive sign, the Syrian opposition coalition, ahead of meeting with Brahimi Friday, formally announced the members of its official negotiating team. Syrian National Coalition President Ahmad Jarba is the head of the Syrian Coalition negotiator delegation in Geneva 2, a spokesperson for the group said. Mr. Hadi Bahra will lead the negotiation. Other members of the Syrian National Coalition negotiating delegation, as announced by the team’s spokesman Dr. Louay Safi, are below the jump. The United Nations on Monday announced that it was formally sending out invitations to a long-delayed Syria peace conference to be convened in Switzerland starting January 22. To date, there has been no decision on whether Iran should be invited, a spokesman for UN Secretary General Ban Ki-Moon said Monday, adding that the invite list had been determined at a meeting between US, Russian and UN officials December 20th. “The Secretary-General is in favor of inviting Iran, but discussions between the initiating States have not produced final results yet,” Mr. Ban’s spokesperson said. US Secretary of State John Kerry and Russian Foreign Minister Sergei Lavrov will meet next week (January 13) to decide if Iran should be invited to attend, the State Department and UN said. Kerry said Sunday, as the US has previously, that Iran could come to the Syria peace conference if it formally endorsed the Geneva 1 communique which calls for the formation of a transition body that has full executive authority. But short of that, Kerry suggested that he and his Iranian counterpart, Foreign Minister Mohammad Javad Zarif, are more focused on trying to negotiate a nuclear deal. 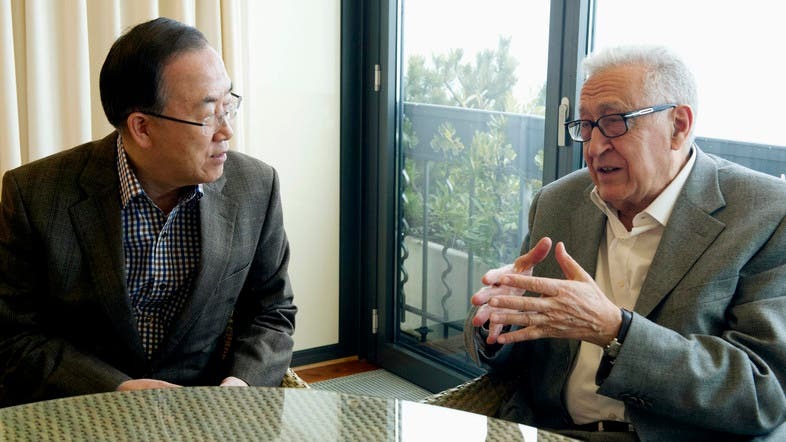 International talks will convene in Montreux, Switzerland January 22, the UN statement said. Then talks for the Syrian participants, facilitated by UN/Arab League Syria envoy Lakhdar Brahimi, will move to the UN’s Palais des Nations in Geneva starting January 24th. Western diplomats expressed confidence about Iran sticking to the terms of an interim nuclear accord signed in Geneva last month as they met to discuss implementing the agreement and the process going forward for negotiating an end state deal. The diplomatic consultations come ahead of a technical meeting between diplomats from Iran and six world powers in Vienna next week that will focus on implementing the November 24th accord. In terms of implementing the Phase 1 deal, “there are obvious facts to be confirmed by the [International Atomic Energy Agency] IAEA – stopping 20 percent, converting half the stockpile… enhanced monitoring,” the senior western official said. Secretary of State John Kerry and European Union foreign policy chief Catherine Ashton discussed that process for implementing the Iran deal when they met in Brussels earlier this week. Deputy Secretary of State William Burns and Under Secretary Sherman were scheduled to meet with French political director Jacques Audibert on Thursday, the State Department schedule indicated. The British non-resident charge to Iran Ajay Sharma, until recently the UK’s deputy political director, was also in Washington for consultations Thursday, after traveling to Iran earlier this week, diplomatic sources said. Burns has been leading a bilateral channel with Iran that gained momentum after the August inauguration of Iranian President Hassan Rouhani, Al-Monitor first reported last month (November 24). Sherman leads the US negotiations between the P5+1 and Iran. The bilateral discussions between Iran and the United States have focused almost exclusively on the nuclear issue and fed back into the P5+1 negotiations with Iran, US officials stressed, though the issue of Americans held in Iran has also been raised. European Union foreign ministers are scheduled to meet on December 16 to discuss possibly suspending some EU sanctions against Iran for a period of six months as part of the first phase agreement reached in Geneva on November 24th. Geneva__ Diplomats from six world powers and Iran said today (Nov. 20) that they would try to narrow gaps to reach a nuclear agreement, but didn’t yet know if they would succeed by the end of this week. “We know what the remaining gaps are, let’s go to work, let’s see if we can get there in a way that is balanced, where all parties feel like this is a good agreement that heads us in the direction of the comprehensive agreement,” a senior U.S. Administration official, speaking not for attribution, told journalists here Wednesday, on the eve of the third round of high level talks here in under five weeks. Amid unusually heavy diplomatic and police security, diplomats did not deny the possibility that if agreement is reached in the coming days, that P5+1 foreign ministers might come to Geneva for a signing ceremony, possibly as early as Friday. The main Geneva hotel used by the diplomat delegations kicked out several people with confirmed reservations Wednesdsy in seeming anticipation of more diplomatic arrivals and their security and press entourages. Events began Wednesday with internal meetings among the P5+1 political directors. Then Iranian Foreign Minister Mohammad Javad Zarif hosted European Union foreign policy chief Catherine Ashton and her team for a working lunch at the Iranian mission that western diplomats described as very positive. “There is a sense of strong commitment on both sides but important differences need to be narrowed down,” the western diplomat described the lunch meeting with the Iranians. The six western powers and Iran then held a very brief plenary session at the Palais des Nations -just ten minutes–before breaking for a series Iran bilateral meetings, including with the Russians and the Europeans. Those meetings ran long, and a brief bilateral meeting between Iranian negotiators, headed by Deputy Foreign Minister Abbas Araghchi, and the US team, led by Undersecretary of State Wendy Sherman, was held, a senior State Department official said, adding they expected to meet again on Thursday. Of the remaining gaps, the western diplomat indicated they mostly concerned technical details in the first phase of the agreement, involving issues such as timelines. But the official seemed taken aback by a query if such details could take til the end of the year to sort out, saying they wanted to finish it well before then. US negotiators say they feel they are close to finalizing a nuclear agreement with Iran for the first time in a decade. “For the first time in nearly a decade we are getting close to [reaching agreement on] the first step towards a comprehensive agreement that would stop Iran’s nuclear program from advancing, and put time on the clock to reach a negotiated agreement that addresses all of our concerns,” a senior U.S. administration official told journalists at a background briefing at the State Department Friday. Under the P5+1 proposed deal that six world powers and Iran will meet again to discuss next week in Geneva (November 20-22), Iran would agree to halt the expansion of its nuclear program for six months. Among the measures the first phase would address: suspend 20% enrichment, neutralize the 20% stockpile, hold steady the stockpile of 3.5% enrichment by oxidizing any more accrued, not install more centrifuges and not operate ones already installed but not yet enriching, including the more advanced IR-2Ms; stop building fuel assemblies for the unfinished Arak heavy water facility, and allow increased inspections and monitoring at enrichment facilities, for a period of six months, according to press reports and what sources familiar with the deal under discussion told Al-Monitor. US officials briefing Friday would not confirm the details of the P5+1 proposal. In exchange, Iran would receive under $10 billion in sanctions relief, including about $3 billion in hard currency assets frozen in banks abroad that would be metered out each month depending on compliance, as well as the suspension of sanctions on auto sales, petrochemicals, gold and precious metals, as well as aircraft parts, sources said. During the six month first phase, negotiators would then seek to reach a comprehensive agreement under which all of the outstanding concerns about Iran’s nuclear program would be addressed, in exchange for the lifting of proliferation related samctions, including on oil exports and those restricting Iran’s access to the international banking system. Iran also seeks language in the accord that would permit it to pursue domestic enrichment for a verifiably peaceful, civilian nuclear energy program as part of an end state deal. The US official acknowledged that Israel strongly opposes a confidence building step that would provide Iran any sanctions relief, even one that would by some estimates double Iran’s nuclear breakout time in the first phase alone. “When it comes to our Israeli friends, and Israel’s security is foremost for us, it is worth noting we share exactly the same objective,” that Iran should not produce a nuclear weapon, the US official said. “We both believe diplomacy should be given a chance, but we diverge on tactical [steps]. We believe there should be a first step. We completely share Israel’s desire for a comprehensive agreement. But we don’t think it’s possible” without a first-step agreement. The official said she doesn’t know if the administration’s appeal to Congress to pause new sanctions through the end of the year will succeed, or if the Senate, pressed by Israel and pro-Israel lobby groups, would move new Iran sanctions legislation in the Banking committee or to attach to the National Defense Authorization Act. Geneva__ Iranian Foreign Minister Javad Zarif said his team will draft the text of a framework agreement with representatives of six world powers, the P5+1, on Friday as negotiations seemed to gather such pace that there was talk that an agreement could even be signed on Friday or Saturday. Amid signs of rapid progress, US Secretary of State John Kerry will travel to Geneva Friday to join the talks, a US official said. “Secretary Kerry will travel to Geneva, Switzerland on Friday at the invitation of EU High Representative Ashton in an effort to help narrow differences in negotiations,” a senior State Department official told Al-Monitor late Thursday. “We are talking about a framework agreement that includes three steps: objectives, end game, and a first step,” Zarif told Al-Monitor in an interview Thursday, one of a series he gave in his Geneva hotel at the conclusion of the first day of a new round of nuclear talks that were stunning for their sense of momentum after years of no progress. Zarif said significant progress on the outlines of a framework deal had been made at meetings over the past month, including at technical talks in Vienna last week. “In the course of the past three weeks…the ingredients of each step have been more clearly defined,” Zarif said. On Thursday, Zarif had breakfast with European Union foreign policy chief Catherine Ashton, then headed the Iranian delegation at a brisk, 45-minute plenary meeting with diplomats from the P5+1. Then the Iranian team, headed by Zarif’s deputy Abbas Araghchi, proceeded to hold four, one-hour meetings, first with three European powers, then with the Russians, then with the U.S. team, led by Under Secretary of State Wendy Sherman, and then with the Chinese. Next comes “starting serious draft writing,” Zarif said. “We know the challenge: just putting on paper all these discussions…We will already have made good progress. Whether it will be enough to sign a joint communique in the afternoon, it all depends on how much progress” is made Friday. Asked if the sense of momentum towards a framework deal after years of little or no progress was an illusion, Zarif said he didn’t think so, but cautioned there were still many potential obstacles. 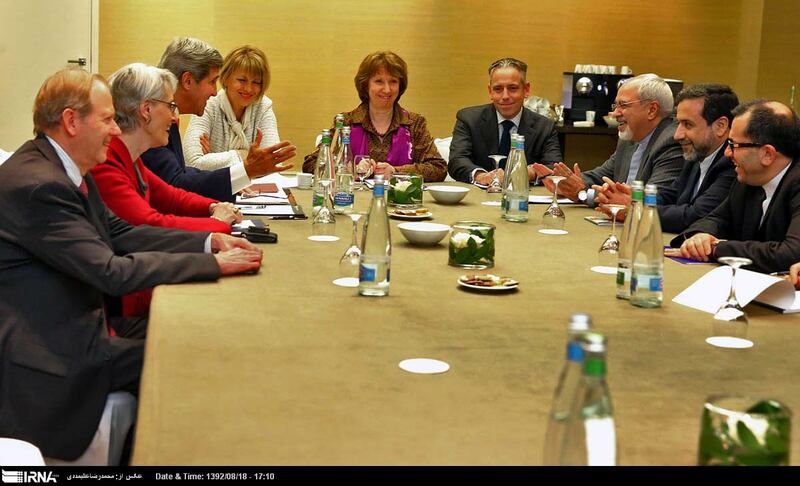 An hour or so after Zarif spoke Thursday, lead US negotiator Wendy Sherman, returning to the diplomats’ Geneva hotel, had an impromptu tete a tete with Iranian deputy foreign minister Araghchi, after encountering him in front of the elevator. The two diplomats spoke for a few minutes in a hallway off the lobby, before Sherrman went up. A U.S. official, speaking not for attribution Thursday, told Al-Monitor that from the U.S. perspective, the talks made real headway in the afternoon meetings.